1. Do I have to wash the garlic first? 2. Do I soak all the garlic into the broth? or only 澆一些在蒜上 when I roast them? 3. 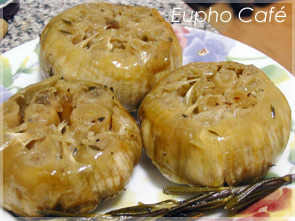 After roasting them, you said 淋上湯汁即可食用, do I use the broth that roast along w/ the garlic, or the non-roast broth?